I arrived to London on 22nd October to spend two months with Ubele Initiative, my host organization on Pandora mobility programme. Ubele is a social enterprise that works around community development and empowering African diaspora in London and England. The focus of Pandora project is on women enterprise, but working with Ubele meant much more than that. I had a chance to meet many different community based organizations and social enterprises, I met many professionals – social activists from different areas and I took part in training courses and conferences. Moreover, through wide range of Ubele's activities and Yvonne Field’s personal and professional engagement, I learned a lot about the organization itself and I also witnessed its growing and going through significant positive changes. At the same time, being based in South Tottenham, North London, I got to learn a lot about the local area and diverse cultures that live here. Living and working here meant being immersed in the mixture of Afro - Caribbean, Jewish, South American, Turkish and many other cultures. I was happy to absorb London’s diversity and acquire local knowledge about this city that before coming here, I could have only assumed or imagined. The first week was a big introduction to the area I was living in and to community based organizations that Ubele is involved in. Wolves Lane Horticultural Centre was a first place to visit and learn about. It’s a 2 acre plant nursery, with greenhouses and gardens that is momentarily looking for a legal and management structure that will run it. It used to be run by a local (Haringey) council but due to their economic problems, it was let to an informal consortium of partners (London Grown, Dee Woods, and Crop Drop.). I joined Yvonne who was facilitating this process with the goal to find a common language between partners and in order to find a way to make Wolves Lane centre a community space, open to public (as it used to be) and local people who could grow their own organic food, share skills, organize events that keep the community alive and together. I was lucky to witness this process of community development in which, despite financial and organizational obstacles, this place seems to be taking the right turn. In this short period Wolves Lane became an important place for Ubele – they are moving their office there. Moreover, it was a place where on 10th December Ubele and other partners organized Festive Market. It was an occasion to test how the present group of organizations can work together and it was also an opportunity to gather local people in this welcoming place that Wolves Lane is. Despite the snow and cold weather, event was really well visited. There were different food and craft stalls from other parts of London, workshops for children and adults, music… Apart from meeting new people, warming up with hot wine, I was managing Ubele’s stall. Next to me was Kate Bruce who has been working with Ubele and who herself is an entrepreneur: she makes her own jewellery with Aggry beads from Ghana. With warm food, mulled wine and positive atmosphere, we all enjoyed an event that signals a bright future for the centre. Community development and in general social actions that come from the grassroots were one of my biggest learning points on the mobility. This transformative process that Wolves Lane is now going through is also supported by JUST SPACE. I had a chance to meet Richard from that network of community groups that opt for a social dimension in community development. They work in all areas of London, trying to raise awareness on social values in city planning and influence local governments and London’s mayor. I was introduced to their work through their engagement with University College London students who were doing four case studies in London. Apart from Wolves Lane, at the beginning of my mobility I also visited Chestnuts community centre where Just Space and UCL students were being introduced to another community based organization called StART. They are a group of residents and workers that are fighting for social justice in St Ann’s hospital site that is due to be sold for private housing development. From the end of October until beginning of December students did a research and field work, interviewing organizations and other stakeholders, in order to do a social impact assessment for those communities. They looked for a social dimension in each of the chosen areas, i.e. they tried to find out what is valuable for the community, what should be kept and what could be changed. After their presentation of results at the UCL, community organizations will be given SIA results that should be more than useful in their further work of advocacy and development. I found this collaborative work of University and organizations so remarkable. It gives hope to communities that in big cities like London can often feel powerless. Under the term regeneration there is a lot of injustice and gentrification happening. People are being displaced or under threat of being displaced. Communities are losing their centres and places of gathering. Seeing these organizations and individuals working together and finding solutions and tools to influence those who bring decision is what actually makes a community. Coming from different context and background, these issues gave me a lot of food for thought: it made me question what community actually means and how is it lived? From what I have observed, in London, where most of the people have long working hours and little time for activism, even for leisure and spontaneity, community actions and communal places are crucial. In places like Wolves Lane events, educational activities around organic food and similar workshops can brings people together and create sense of belonging. Moreover, through other examples I named above, I was also reminded about the value people ascribe to places and neighbourhoods they live in and its importance. They could be easily forgotten if there wasn’t work of organizations such as Ubele, Just Space, StART…, and many other organizations that work to bring social dimension in city planning and community development. One of Ubele’s main values and priorities is intergenerational work. It is an important part of the PatHERways London project that is created for a group of young BAME women who are, through gatherings and different educational and empowering workshop and activities, supported in their personal and professional journeys. I took part in it by attending some of the group meetings and by facilitating mapping workshops. I facilitated first mapping workshop during the Residential Weekend from 24th to 26th November, that was organized by Yvonne Field. We took a train to Suffolk and stayed in a cosy Darsham House Country Centre that for those days became a home for sharing ideas and creating connections and friendships. Apart from a lovely group of young women, there I also met Sireita Mullings who is an artist and university professor that collaborates with 198 Gallery in London, which is one of the organizations involved in MALI Enterprising Leaders project, about which I will talk later. With the help of Yvonne and Sireita, participants were developing their own project ideas and reflecting on their social activism. 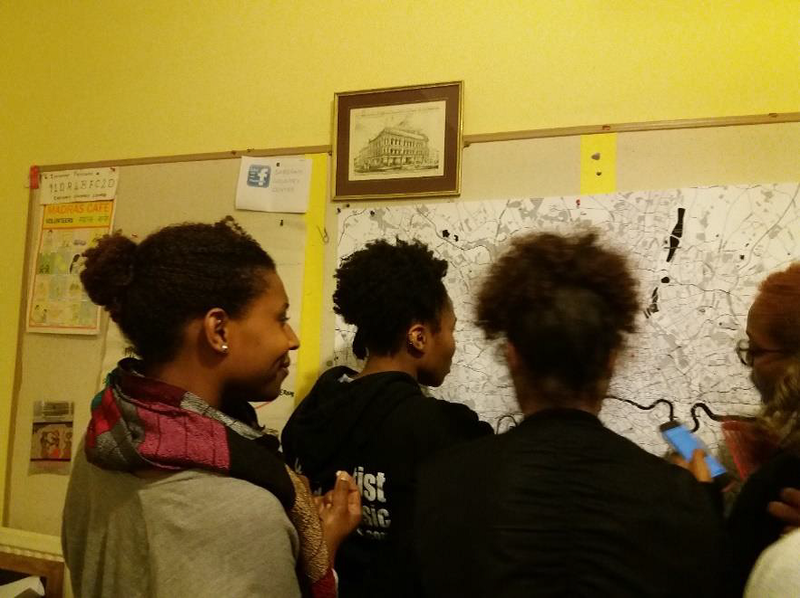 During my workshop, they were introduced to mapping as a tool for exploring their histories, stories and memories. Listening to those young women whose experiences are already now admiring, I also got to learn a lot about experiences and often unfavourable context in which BAME women are growing up in London. That is why I find this project to be so significant: professional support and sense of belonging and acknowledgment that they are getting through different activities (residential weekends, workshops, sessions on social activism, project evaluation…) is what ideally every young person should be getting. Through my involvement in PatHERways project I also learned so much about older generations of women who were community activists. During my second workshop of mapping, which was organized on 5th December in Karibu Education Centre in Brixton, older BAME female activists were sharing their memories with young PatHERways women. It is when I noticed how important intergenerational dialogue is. Those stories that shaped London’s communities are such an influential tool for empowering young women in becoming change agents in today’s society. I am grateful for being given the chance to lead those sessions and participate in creating a digital map of intergenerational connections between BAME female activists. In this particular, my path, I was also lucky to meet Santa Pedone who has been so supportive and collaborative when designing and developing digital maps that will capture intergenerational memories on community activism. I am looking forward to seeing results and follow Ubele’s future intergenerational work. Another project I got to learn about is MALI Enterprising Leaders, which is the first community business pilot project created for BAME community organizations. It seeks to give support and create opportunities to five different organizations in London and Manchester. I went up to Manchester to meet Angeli Sweeney, who is one of the partners, and who works at T.A.P project, a community led initiative that supports diasporic Africans in local communities. We met at the “Blue Nile Café”, an Ethiopian restaurant run by Tiggy who came to England long time ago and opened her restaurant. We were warmly welcomed and served delicious food. I was told how the place used to be struggling, but thanks to a good promotion and hard work, it was so nice to see another successful women’s enterprise story. While Tiggy was showing us a coffee ceremony, I was learning about Angeli’s engagement with youth and BAME communities. She explained me how the work of TAP (African POT) is all about education, health and wellbeing, community development and enterprise, but also all other cultural and recreational activities that promote participation of diasporic Africans. She told me about events that were organized through partnership with Project Mali Manchester partners, such as Sunday Solutions: Black and British, Assets, Enterprise and Development, Kanza Celebration, Celebrating Youth Weekend. Spending time with Angeli opened new chapters in my knowledge about youth work, sociocultural context in the North of England and especially complex socio-economic issues that Black communities have been going through since their arrival to England. We spent a lot of time talking about mental health that is in general marked with prejudices and stereotypes, but when it comes to BAME communities, medical services are often too scarce. The conversation about health issues was continued at The Jamaican Society centre, where we attended a celebration of International Men’s day and where a talk was held about raising awareness on men’s health. It was an opportunity to see another Afro Caribbean community place which works as voluntary organization whose ideas are centred on fostering kinship and giving support to Jamaicans in Manchester. While in the North, I went for a half day visit to Huddersfield. It is a small town where Yvonne Witter lives. She is a Mali project evaluator who I met during her Pandora mobility period in Palermo. As always, she warmly welcomed me and introduced me to Sophie Simpson, a chief executive officer of the Conscious Youth organization. Sophie hosted us in their office and explained me how her engagement with youth started from identifying needs of young Black people and lack of proper opportunities for them. They started of a stirring group in 2015 and after organizing their first event called “Back to our roots”, they grew to a community organization that is now creating and delivering projects and programmes that aim to improve the emotional and mental resilience of young people. “Stepping up and stepping out” is one of their programmes, designed for age groups 8 to 24 years to offer a change process and focus on self-development and character building of young people. Continuing on how community development and social action coming from the grassroots have been one of my greatest learning points, I would like to mention other relevant events and learning opportunities that broaden my knowledge. In November I attended “Connecting communities” international conference that was hosted by the University of Greenwich in collaboration with Open University and the University of York. After few years of break from “formal” studying at the University, this two-days conference has been a real refreshment and an eye-opening for my anthropological background and current work. I attended lectures, performances and presentations of Participatory Arts and Social Action Research projects that had been developed all over the world. I have seen and heard about positive transitions of formal and standardized academic approach into something more inclusive and engaging. Talks were given by academics from a range of social science, humanities and arts disciplines. With their different examples they showed how research should be done for (social) action and how its beneficiaries should be communities. I got very important inputs on how interdisciplinary researches can bring real changes to all the stakeholders involved in the research. I learned more about interesting methodologies such as Theatre of the Oppressed in working with small, rural communities; how Social Theatre can be combined with Walking and Mapping methods in working with migrant women, how Music and other Art therapies can be used in prisons or with other oppressed minorities. I also learned about other community organizations and their participatory action research experiences in England and Scotland. It has been more than inspirational and useful listening and absorbing different examples of (auto)anthropology and mapping methodologies that I have started using recently. Apart from the conference, there were more stimulating events and educational opportunities. During the Global Entrepreneurship Week I attended a workshop designed to empower and motivate women to run successful business. It was organized by Haringey Enterprise Support Network in the 639 Enterprise centre in Tottenham where Ubele’s office had been based. It was a good learning opportunity on how to start your own business; together with other women we were motivated to develop our own project ideas. At this, as in many other events, I also learned about the importance of networking. On another occasion, I met Tony Cealy who is a drama and theatre practitioner trainer and who has been working with disadvantages groups all over the Europe. I attended his training course “Beyond resistance” that was designed to experience, practise and learn a variety of techniques in managing and dealing with resistance and disengagement in challenging settings. One of the memorable events I attended was 20th anniversary of ROTA – Race on the agenda. It is Britain's leading social policy think-tanks focusing on issues that affect Black, Asian and minority ethnic (BAME) communities. The event was held on 30th November at the House of Lords and it was dedicated to celebration of ROTA’s continuous work in increasing the capacity of BAME organisations and strengthening the voice of BAME communities through increased civic engagement and participation in society. I met representatives of other community organizations in London and I learned about the historical aspect and efforts that organizations and individuals are making in order to reduce racial, class and gender inequalities BAME people are facing. Working with Ubele I got introduced to so many remarkable individuals, organizations and enterprises. I met Gina Osbourne who has been working with Ubele for several years and who told me about Luminary Bakery, a real example of women’s enterprise in London. I visited their café and met their manager Rachael Coulson who told me how they grew from being a charity to a social enterprise that uses baking as a tool to give women opportunity for employability and entrepreneurship. Over a period of six months they offer courses and work experiences that allow women to start building their career. Having already volunteered in migrant reception centre in Palermo, it has been a really valuable experience visiting and spending time in one of the London’s migrant centre in Haringay. I spent two Mondays with the kitchen team preparing meals for all the visitors, I met local volunteers and learned a bit more about legal structure of the place and about most common issues migrants were facing. HMC has been opened for five years, there are only four people employed but there is a lot of help given with the assistance of 40 volunteers. On Mondays, only day when they are open, they offer warm meal and consultancy and legal help. One of the most recurrent problems is housing, especially for single mothers. Often migrants don’t know their basic rigths, so the volunteers help with dealing with their administrative issues, translation, advicing and if possible, housing. As I mentioned at the beginning, this cultural immersion and learning from just living in London, has been so empowering. I am grateful to all the stories that were shared with me, starting from my environment to people I was encountering. From South Tottenham down to Brixton, from London to Manchester, from my Jamaican house to Ubele’s (new) office; in these two months I have absorbed so many information and impressions. These experiences have broadened my knowledge that was primarily shaped in a completely different geographical and cultural context. I learned through London’s stories and people. I embraced all my challenges and all the ups and downs of living in this big city. There were sunny, but also rainy and gloomy, even snowy days, but they were all so inspiring and inviting. I enjoyed exploring London, its innumerable cultural melanges north and south of the river Thames; I loved continuous visits to Tate Museum, walking by canals and each day knowing better London’s tube system. I am grateful to HRYO Human Rights Youth Organization for offering me this opportunity and I am especially thankful to Yvonne Field who has always been available and ready to involve me in all the activities of Ubele. She assured my stay in London would be fulfilled with interesting and stimulating content. I am also grateful to all people who were open to participate in my personal project City as a person. And lastly, I am grateful to this city whose broad spaces and good vibes have reminded me of my passions on writing about urban spaces and cultural diversities.